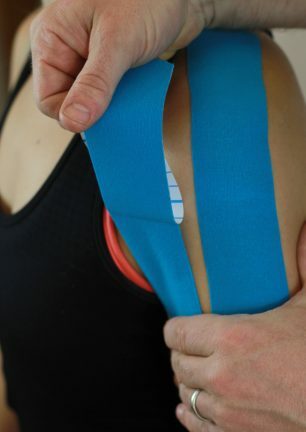 Taping has two uses in the treatment of issues. The ‘old fashioned’ classic use is to help immobilise, support and protect injured tissues whilst they are healing. This is the role of much of the taping seen on rugby fields around the country. In recent years a further use has been to assist in activation of under active muscles and inhibit overactive ones. ‘K’ tape or ‘Rock’ Tape is very elastic and can be applied for several days in specific patterns to facilitate functional patterns of movement. It is not fixing or blocking but assisting and enhancing. We have found this very useful in the treatment of many issues that have muscle imbalance at its core.